Bitcoin Money Machine is described as a miracle software that can generate profits for you automatically, but don’t be fooled. Bitcoin Money Machine is just a scam. We’ve had readers who signed up and lost huge sums to it, so make sure you read the full Bitcoin Money Machine review if you are considering to sign up for the software. LEGITIMATE? NO, IT’S A SCAM! Bitcoin Money Machine claims to be a software that capitalizes on bitcoin exchange rate fluctuation across the world, and make profits by trading the cryptocurrency. Warren Young, the alleged owner of the software makes a typical over-exaggerated promise of making you thousands of dollars a day with just a few clicks. First of all, you need to realize that there’s no software on the internet that can generate automatic profits for you. There are a lot of online scams that promise just that, make sure you don’t buy into the hype. These scams usually need you to sign up or make a payment before revealing anything, and it’s too late when you realize that you have been scammed. Bitcoin Money Machine is one of them – you don’t really know how it works, and you need to deposit a hefty sum of at least $250 to find out. Throughout the sales video, Warren doesn’t really explain how Bitcoin Money Machine really works . So in this review, we’ll explain how it works, how Warren tries to trick you into signing up for the scam, and finally how to make money online for real. How Does Bitcoin Money Machine Really Work? Taken from FAQ: Just point and click to make $1,000 a day? Throughout the sales video, Bitcoin Money Machine has been trying to brainwash its victims into thinking that there is really a miracle software that generate automated profits. However, as much as they want to keep you in the dark, they have to reveal the true nature of the scam somewhere within the website to prevent legal actions. In this case, the truth is hidden deep in the disclaimer document, much like the hidden secrets in some long-dwindled terms and conditions. The only way to access the disclaimer is to find the small fine print at the bottom of their sales page that reads “risk disclaimer”. You can authenticate our screenshot against their original disclaimer at this link: websiteterms.co/BitcoinMoneyMachine. Bitcoin Money Machine allows its users to trade in highly speculative investments which involve a significant risk of loss. Due to the high risk nature of trading, ‘Bitcoin Money Machine’ explicitly does not make any express or implied warranties or guarantees that user will make any profit or that user will not lose any or all deposited investment funds. Using Bitcoin Money Machine is far from guaranteed. in fact, it engages in extremely risky, speculative investments. 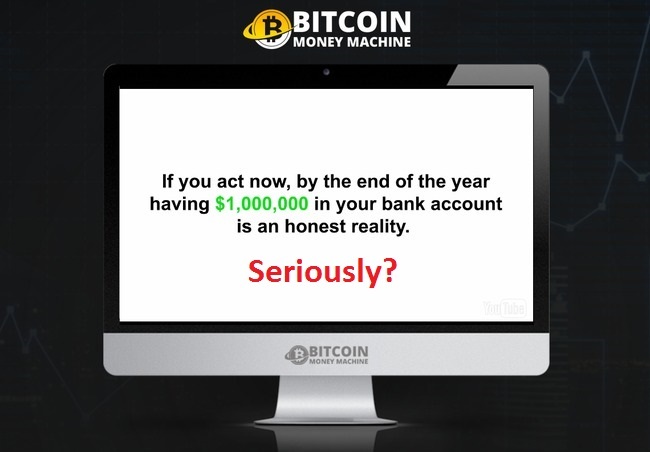 Self explanatory – Contrary to what they promise in the sales materials, Bitcoin Money Machine scam does not guarantee you any profit. Not only that, you will most likely end up losing ALL of your deposited investment funds. Again, Bitcoin Money Machine scam admits that trading binary options is extremely risky, and it is only for investors who can stomach the loss of their entire investments. Evidently, what they have revealed in the risk disclaimer is totally different from what was promised in the sales material. Not only that, we have understood from the disclaimer that Bitcoin Money Machine is in fact, an automated binary trading software. To put it simply, it’s a piece of software that allows you to engage in the highly speculative and volatile binary options market. It’s so risky that even Forbes warns us against gambling on binary options. The fact that our readers lost their $250 deposits in quick succession using Bitcoin Money Machine is more than enough reason for you to steer clear of the scam. If you provide your email address in the homepage of Bitcoin Money Machine to reserve a spot, you will invariably be brought to the members area, where Warren congratulates you for “getting a spot”. In fact, anyone who has the URL can access the members area. There are no spots to reserve. Check this URL in a new browser window and you’ll know what I mean: bitcoinmoneymachine.co/members. When you reach the final registration page, you’ll be given exactly 14 minutes and 30 seconds to complete your registration, or the spot will be gone forever. Now that we know there is no limited spots to compete, why is there a need to rush the registration process? The countdown timer actually just a computer script that is programmed to countdown from 14 minutes 30 seconds every time the webpage is loaded. Try refreshing the webpage of Bitcoin Money Machine at any point of the countdown, and you’ll realize that the timer resets to its original 14 minutes 30 seconds, no matter how much time was left before that. This is a marketing tactic used frequently by online scams to force its victims into action. It leaves you no time to analyze the scam rationally. Before you know it, you would have already surrendered your precious personal phone number to be scammers. What follows is a barrage of high-pressured sales call pushing you to deposit money into your trading account. BITCOIN MONEY MACHINE IS A SCAM. We strongly advise you to stay away from the scam if you don’t want to lose your hard-earned money. The Centument Project 2.0 Review – Avoid This Scam! I deposited $250 and after 5 trades I have only $125 left. How can I save the rest of my money? Stop the software auto-trading feature immediately and write to your broker for a refund of your remaining fund. Follow up with them if they don’t reply to you.